The IAA invites advisory firm executives from across the country to join us in Washington, DC for our 12th Annual Adviser Advocacy Day on June 13, 2019. Participation is free – and the IAA will arrange personalized schedules for all participants to meet with their members of Congress and their staffs. We provide participants with talking points on key issues, as well as critical information about the economic value of our industry in the individual participant’s state and to the nation as a whole. Our government relations staff will brief participants on the issues in a special webinar in advance of Adviser Advocacy Day, and again in person on the morning of our Capitol Hill visits. And the evening before our Hill visits, the IAA Board of Governors will host a complimentary welcome reception and dinner featuring nationally known political and economic strategist Greg Valliere. All Adviser Advocacy Day events are complimentary. While participation is free, we do ask that participants register in advance. If you have registration questions, please contact us at IAAEvents@investmentadviser.org or (202) 293-4222. Our welcome reception and dinner, pre-Capitol Hill visit issues briefing and post-visits reception will be held at the Phoenix Park Hotel. 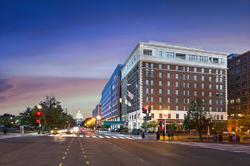 The IAA is holding a limited number of guest rooms for Adviser Advocacy Day attendees at a rate of $299.00 plus tax. If you would like to reserve a room at the hotel, email Lisa Gillette at lisa.gillette@investmentadviser.org.